An easy to use guide, listing all of the town centre shops, pubs, restaurants etc. Explore by location or search by product or shop name. There are also a few short walks with some local history, starting in and around the town. 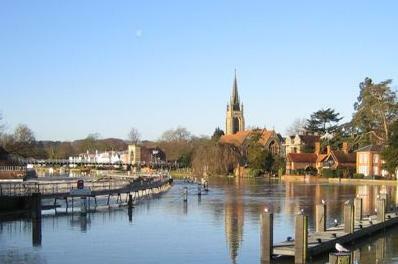 Marlow is a very attractive riverside town, with an interesting range of shops, pubs and restaurants. For non retail relaxation, there is the very pleasant and green Higginson park with imaginative play facilities, and connection to the Thames Path and rural walks. This guide lists all the shops, pubs, restaurants and other establishments in Marlow town centre as at the date noted above. You can explore the town shops etc using the Location View, the map enabling you to jump from place to place. If you are looking for a particular product or service, you can use the Product Index or Search box. The Name Index or Search box will help you find a specific shop by name. The street plan and shop entries are colour coded to help you know &apos;where you are&apos;. Clicking a letter (location marker) on the map will take you to that place. Alternatively you can just continue at the end of each page to follow the pre-set route. Every establishment has at least a basic entry. The establishment owner can include some information free, or more information for a small subscription (free for charities). All establishments are linked to the Product Index for a top level product/service description, eg &apos;clothing&apos; or &apos;cafe&apos;. Some establishments may have additional specific products included and will be listed when one of these are selected. You can also use the Search box and type in a product or service or the name of an establishment. All establishments are listed in this index. Establishment Owners: Your establishment is listed for free in this guide, and can include a short description in your own words and a couple of product links to the Product Index and Search facility. For a small subscription you can include more and also help publicise this guide; please visit this section to find out more. Walks in and around Marlow and a little bit of history. Some are short strolls from the town centre, some are country walks a short drive or bus ride away. Directions to the Medical Centre. Links to Walks on other websites. Looking for a product, service or somewhere local to stay? www.marlowdirectory.org.uk lists a range of services and providers in and around Marlow (and some further afield). If you are connected via mobile data and wish to minimise its usage, this Minimal version is very simple in appearance and functional. You can keep it text only, or select to show specific images. Click on a Red letter, in the Street Plan to be 'taken there' in the Location View. An easy to use guide, listing all of the town centre shops, pubs, restaurants etc. Explore by location or search by product or shop name. Last updated - Jan 2019. Minimal Option: If you are using a mobile data connection and wish to minimise usage, you can choose this option. The Minimal version is very simple in appearance and text only; with the option to show each picture and/or location map individually. The other links on this page take you to the Standard version, which will typically display a few small images and hence use a bit more mobile data. Select the establishment name to show more details. Select back to return to the list. Select the establishment name to show more details. Select back to return to the Name Index. 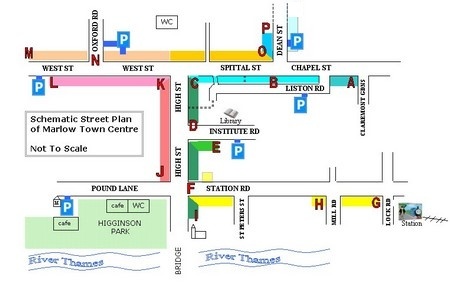 The street plan and shop entries are colour coded to help you know &apos;where you are&apos;. You can jump to a place on the street plan or you can just continue at the end of each page (or go back) to follow the pre-set route. Selecting an establishment will show more details. Enter word(s) of 4 characters or more. You can choose 'All' ( to only return search results that contain all of the words ) or 'Any' ( to return search results that contain any of the words ). Then select 'Search This Guide'. Select the establishment name to show more details. Select again to return to the list. Your establishment is listed for free in this guide, and can include a short description in your own words and a couple of product links to the Product Index and Search facility. Please visit this section to send me the details you would like for your establishment. For a small subscription you can include more. Looking for a product, service or somewhere local to stay? This directory lists a range of services, providers and organisations in and around Marlow (and some further afield).